When I went to San Francisco and went grocery shopping with the friends I was staying with, I was so impressed with the freshness and variety of the produce available. Lemons smelled like lemons and there were so many more kinds of mushrooms (compared to New York City). I usually don’t cook when I travel but when I saw these ingredients I had the urge to cook something. So I bought these mushrooms to make a risotto. 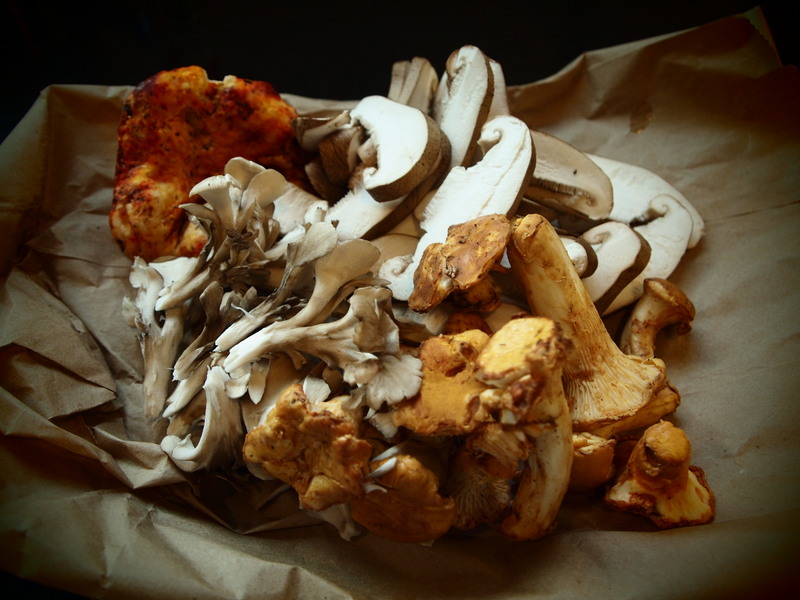 Maitake (hen of the woods), lobster mushrooms, chanterelles and shiitake. I also got some dried porcini. Soaked them in water and used that water as part of the mushroom stock. 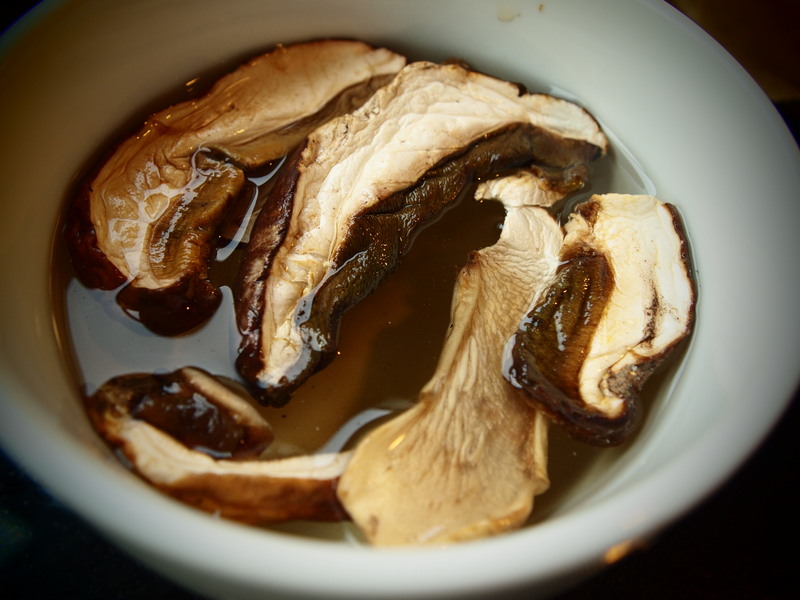 To make mushroom stock you can use scraps or button mushrooms. Just combine equal parts (by volume) of mushrooms and water and add a bit of salt. Bring it to a boil and let it simmer until you get the flavor you want. The general rice to liquid ratio for risotto is 1 to 3 but you can always keep extra mushroom stock and play around with it to get the consistency you want. Making risotto is fairly simple but you have to constantly stir to achieve the right consistency. Sweat some shallots in olive oil until fragrant then add a cup of arborio (or carnaroli) rice. Stir and coat each grain of rice with the oil. Keep some mushroom stock hot on the side and pour enough to just cover the rice. Stir occasionally to prevent the rice from sticking to the bottom and burning. As the rice absorbs the liquid, keep adding a ladle of stock until you have added around 3 cups. Taste to check the texture and add more mushroom stock if needed. 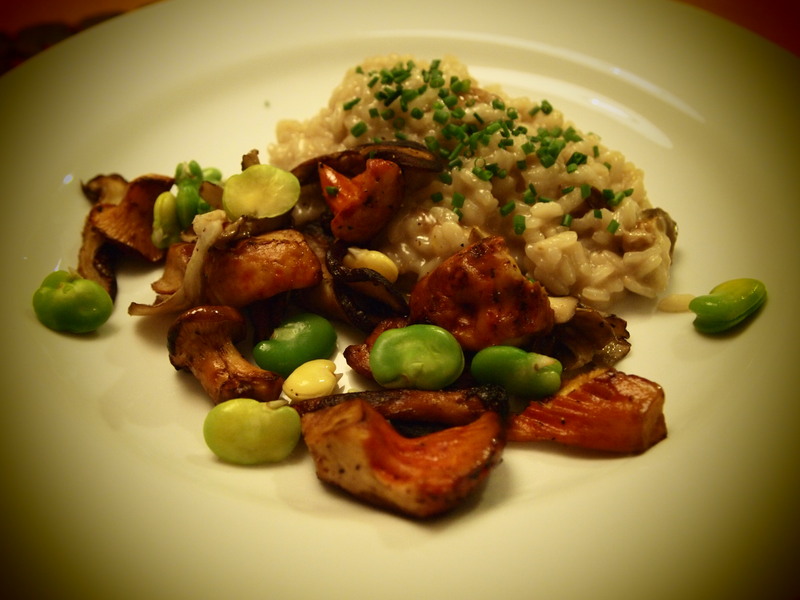 I seared some mushrooms and folded them into the risotto (blanched fava beans too). Finish with a generous amount of grated pecorino and a bit of butter to make it nice and creamy.